Meet‐ups are fan­tas­tic things. When you can meet a group of peo­ple that you have com­mu­ni­cat­ed with on­line for some­time, the feel­ing can be amaz­ing. This is ex­act­ly what hap­pened in Washinging, DC, as hun­dreds of video game and me­dia ethics en­thu­si­asts gath­ered for a meet‐up at the Local 16 restau­rant on U Street this past Friday. Colloquially dubbed “GGinDC,” the event had press, aca­d­e­mics, de­vel­op­ers and hun­dreds of glo­ri­ous gamers fi­nal­ly get­ting to meet each oth­er in real‐time. This writer was sad­ly too poor to at­tend, but the events looked like a blast. And this is where that last state­ment turns into a bad joke. We have reached out to the Washington, DC MPD (Metropoliten Police Department) for com­ment on this. We have yet to re­ceive a re­sponse as of the time of pub­lish­ing, but we will keep this piece up­dat­ed with their re­sponse. On Friday, May 1, 2015 at 9:30 pm the Metropolitan Police Department re­ceived in­for­ma­tion from the FBI in ref­er­ence to an in­di­vid­ual post­ing on Twitter that a bomb would be det­o­nat­ed in­side of 1602 U Street, NW (Local 16 restau­rant and bar) if the event they were hav­ing was not post­poned . The es­tab­lish­ment was host­ing a gam­ing event. MPD con­tact­ed man­age­ment at the es­tab­lish­ment, and the de­ci­sion was made by the man­age­ment to evac­u­ate the lo­ca­tion and check for haz­ardous de­vices. The es­tab­lish­ment was evac­u­at­ed and the premis­es was then swept for haz­ardous ma­te­ri­als with noth­ing found. The in­ci­dent re­mains un­der in­ves­ti­ga­tion. Any per­sons with in­for­ma­tion about this in­ci­dent are asked to call po­lice at (202) 727‑9099, or by tex­ting to 50411. This comes af­ter ear­li­er at­tempts on so­cial me­dia to put pres­sure on Local 16 to shut down the meet‐up. Some even go­ing so far as to call the establishment’s own­er, pleaing that they not al­low the group to gath­er at the U Street restau­rant and bar. These two events are un­con­nect­ed as of this time. There is no sol­id ev­i­dence to sup­port their con­nec­tion, and I re­al­ly hope that any­one with half a brain cell would know not to waste the time of Washington, DC po­lice and fire de­part­ment re­sources to dis­rupt an event they dis­agree with. Until we can get con­fir­ma­tion one way or an­oth­er, I urge our read­ers to not as­sign pre­ma­ture blame to one group or an­oth­er. Who ever did this pos­si­bly put lives in dan­ger by dis­tract­ing po­lice re­sources from any real events oc­cur­ring. Besides be­ing il­le­gal, it is just a plain cow­ard­ly ac­tion, whether by a third par­ty troll or some­one who dis­agrees with those who gath­ered. It’s worth a ma­jor note, that de­spite the turn to the evenings events, the at­ten­dees to the “GGinDC” meet‐up didn’t let their evening get spoiled by the ac­tions of a cow­ard. 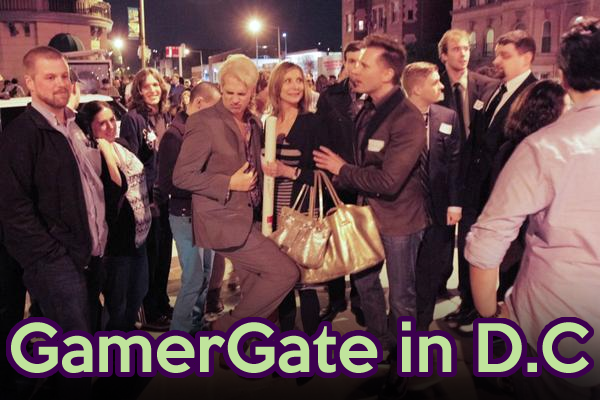 Local 16 even re‐opened af­ter every­thing was clear with free shots for all, and many friend­ly con­ver­sa­tions about what Gamergate is. This writer is glad that every­one was safe that night, and is proud that they did not let this scare tac­tic ruin the event. Extra ku­dos goes out to the folks at Local 16 for al­low­ing the event de­spite pres­sure, and their re­sponse to the scare.